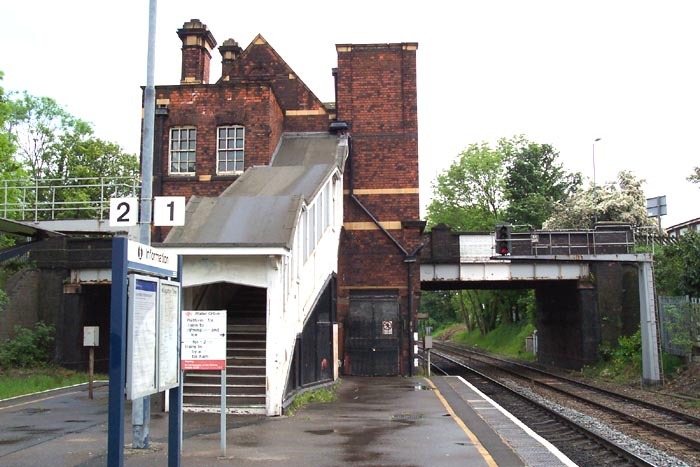 Originally opened by the Birmingham and Derby Junction Railway in 1842, the current station, opened by the Midland Railway in 1909, is several hundred yards along the line from its predecessor but is still of considerable historical value and interest. I was, however, quite dismayed by the terribly dilapidated state it is in currently. 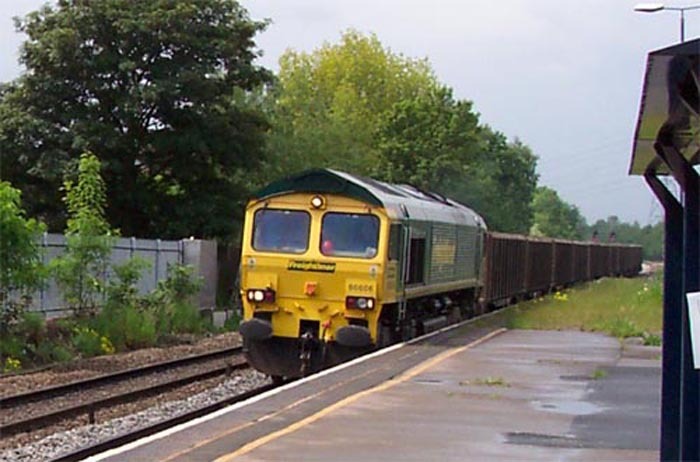 On the plus side, for the spotters among you it is a spot I recommend as the traffic is frequent and varied from Virgin Voyagers to DMUs and an endless stream of freight (66s - see the Train Pics page). 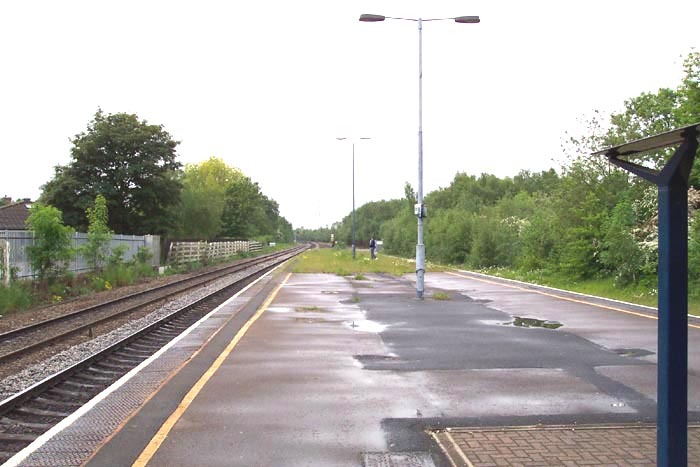 From the perspective of someone interested in the archaeology of railway infrastructure, however, it is a saddening site. 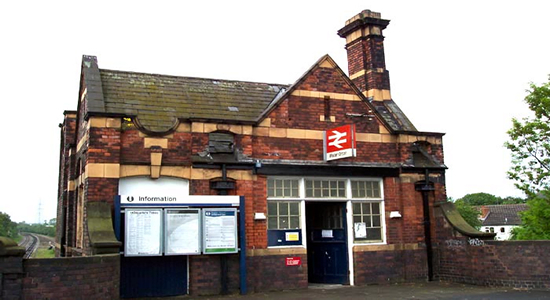 Above we see the station building perched over the tracks on Minworth Road and at first glance it is quite an appealing entrance and has retained its original character. 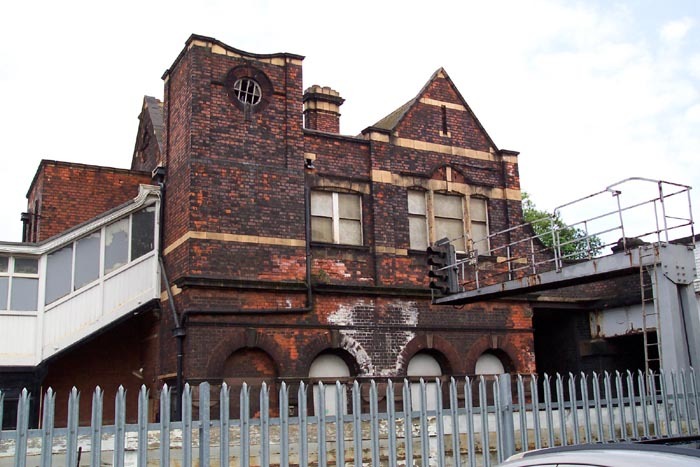 Unfortunately, above-left is the view from the car park off Birmingham Road and, especially in the enlarged photograph, the deterioration can clearly be seen with peeling paintwork, broken windows, damp problems etc . 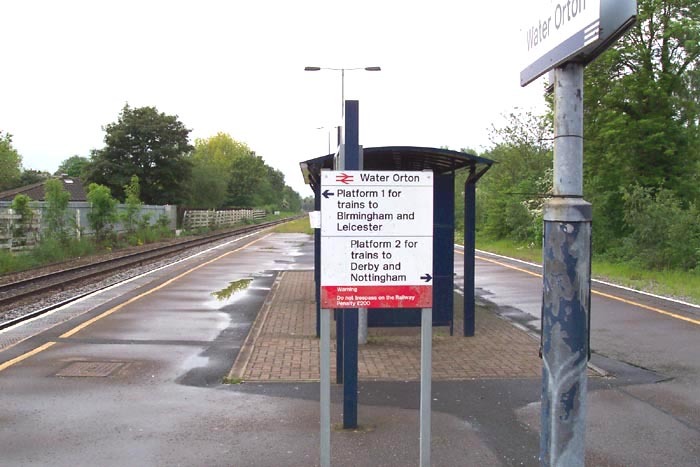 . . Above-right we are on Minworth Road bridge with the station building to our right looking down at the station in the direction of Birmingham and can see that all that is now operational is a single island platform, heavily overgrown hosting one 'bus shelter'. Upon walking into the station building the first thing that hits you is, well visually - the smell of urine is fairly strong, the boarded-up ticket window. The interior must have been quite alluring, albeit small, when the station was fully functioning but it is now reduced to an unstaffed ad-hoc urinal. 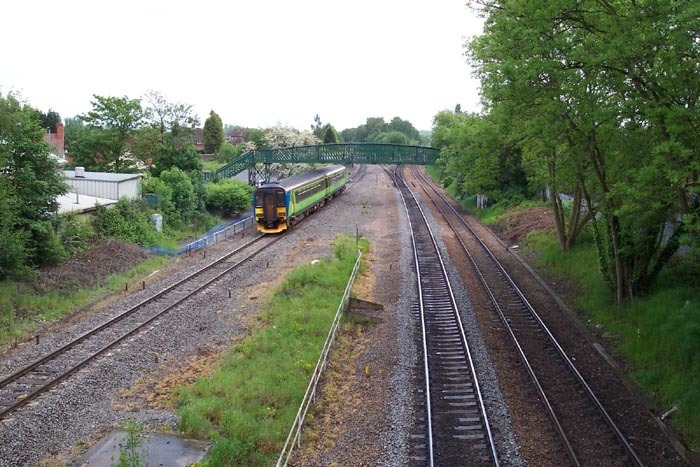 Above-left is the view from Minworth Road bridge towards Derby with the dominating presence of the Manor House Lane footbridge spanning the tracks. Above-right is the 'no expense spared' destination board that greets you when you arrive at the bottom of the staircase from the booking hall along with the customary warning not to trespass on the railway or you'll be fined £200: this annoys me as firstly, who is going to know and secondly, maybe if they staffed their stations there would be less chance of such an occurrence, which is obviously of concern to them, happening? I think a vicious circle is in operation: they can't afford to staff all stations, not surprising considering with no staff a fair few passengers can ride for free, but if they did staff them then they would be more certain to obtain fares from all travelling passengers. I've ridden just over 40 local journeys thus far in 2004 and only had a ticket checked once: no wonder they can't afford staff! Anyway, rant over (one of the benefits of such a site as this is that it does have an 'unburdening' function). Above-left we are looking along the platform in the direction of Birmingham. 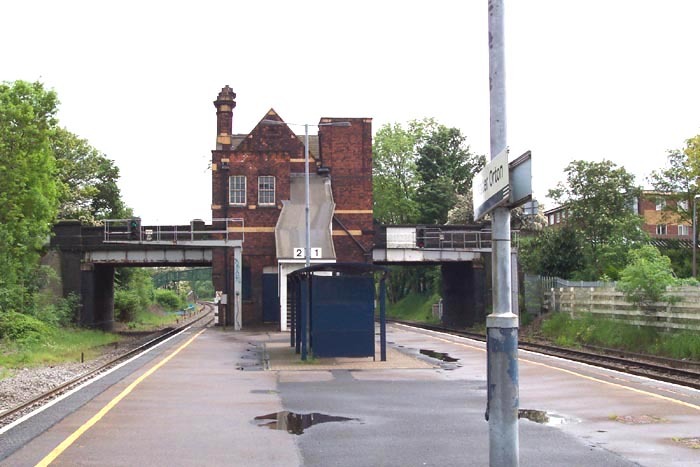 Above-right we are in the same spot but have turned back to look at the station building and the bridge carrying Minworth Road. 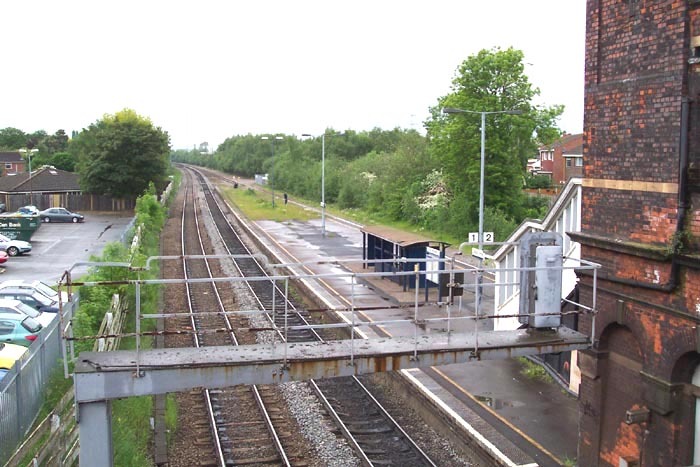 Above-left is a similar shot again of the station building and Minworth Road and above-right is 66606 passing through the station on a goods working. Not a lot to say about the station other than if you are a spotter go there, if you are not, it is only worth a passing visit.